Chinese New Year starts Feb. 16. We are a wee bit obsessed with longevity noodles, five-spice soy chicken, and shrimp with melon. 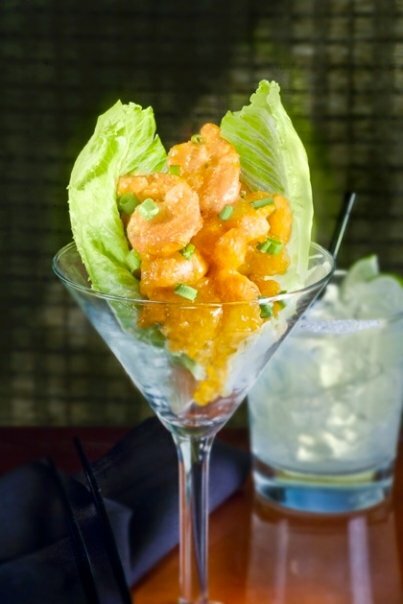 Menu says: Dynamite Shrimp. Tempura-battered, tossed in a light, spicy sriracha aioli. Their twitter account says: The perfect mix of sweet and spicy. Some online copy cat versions we found are calling for Kewpie mayo, sriracha, honey, chipotle powder and green onion for the top. But keen on either chipotle powder or a shake of chipotle hot sauce. How lazy is this: we purchased popcorn shrimp from a local take out joint and tumbled it in this P.F. Chang’s sauce clone at home. First time out, we blended some mayo with sriracha, sesame oil and a dash of rice wine vinegar. It was fantastic. But so rich! Next time: We’ll ditch the oil and vinegar and go for sweet/rice wine tasting Kewpie with a shake of chipotle hot sauce and sriracha. A winner. 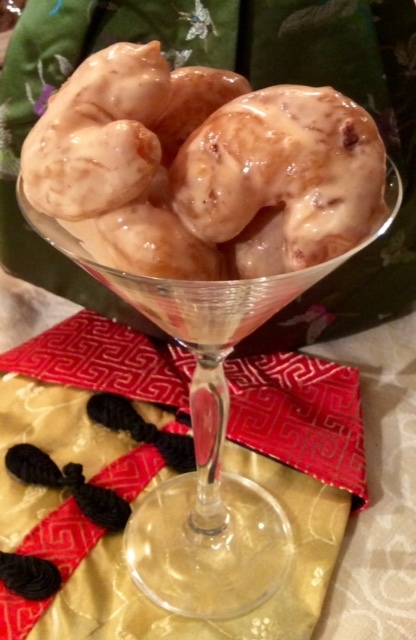 How fun this copycat recipe project has been. There is a common clone version of P.F. 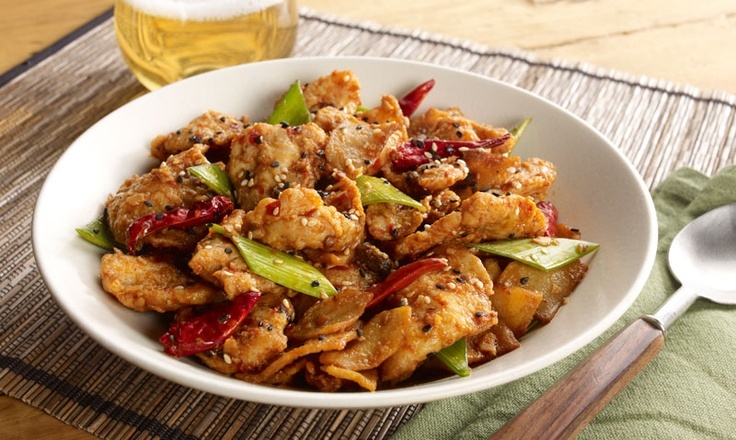 Chang’s Spicy Chicken floating around the web. You can spot it when you see the pineapple juice listed among the ingredients. It’s wrong. The menu says: Lightly dusted and stir-fried in a sweet Sichuan sauce. 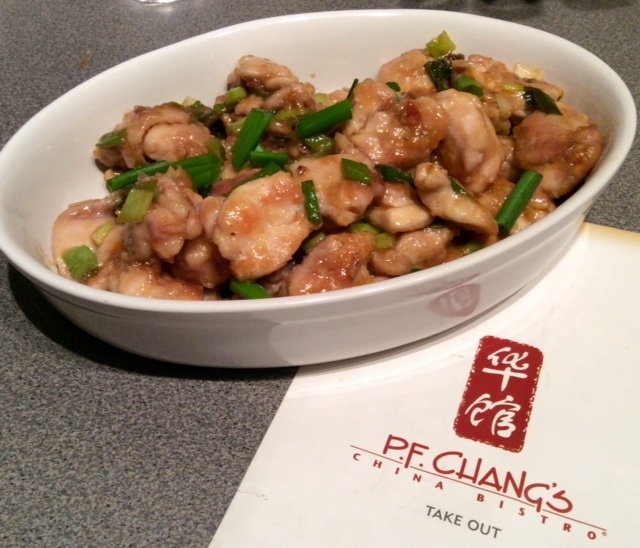 Our version of General Tso’s and always a favorite. This clone version is a delight. You’ll feel the tingle on your lips long after you’ve eaten. We like that the sauce isn’t too saucy: just enough to cling to the chicken. And we like how clean the flavours are: no overly-salty soy here. We served with rice and steamed carrots and broccoli and it was heavenly. Plus, we love the insider feel of the “house white sauce” and “Chang’s sauce” we found in recipe forums. Enjoy! Lightly coat chicken with potato starch. Mix sauce and stir to melt sugar. Brown chicken on both sides in batches. Remove from pan, pour in sauce, stir, add chicken back to pan. Sauce should cling to chicken. 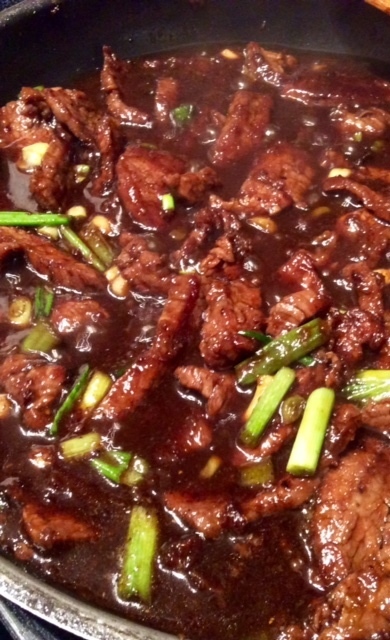 Mongolian beef has a cult following online. There’s good reason. It’s fantastic. 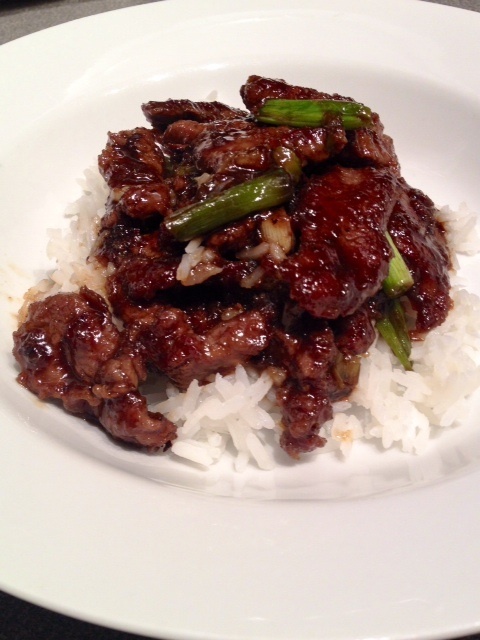 Sweet, soy-glazed flank steak wok-seared with scallions and garlic, the menu describes. P.F. 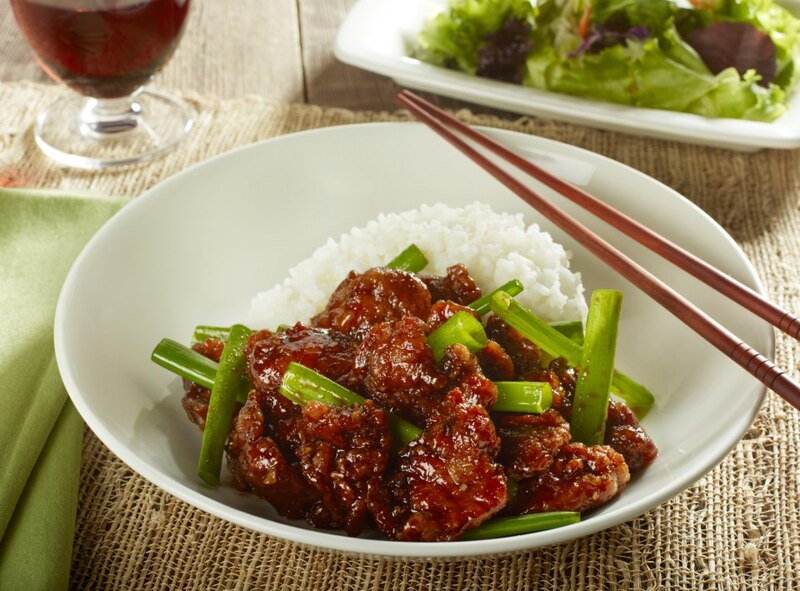 Chang’s once posted its own gluten-free recipe on its website, calling for a much simpler and drier version with just 2 fl oz of soy sauce to 2 tbsp sugar with just 1 tsp rice vinegar. The sauce is supposed to cling to the meat: no pools of sweet sauce there. The copy cat recipe variations floating around the web are drowning in sauce. But it is delicious. This dish is RICH. Serve a few lovely bites with accompanying dumplings or steamed veg rather than tucking into heaping bowls of the stuff (like we did.). Let us declare: we are not in the “1 cup of oil for frying” camp. And while you’re basically aiming for beef caramel, we prefer 1/2 cup brown sugar to the 3/4 cup recipe. ½ cup light/low sodium soy sauce (we’re going to cut back slightly by watering it down a touch). Mix sauce ingredients (ginger, garlic, soy, water, brown sugar) we used our pyrex 2-cup measuring cup and set aside until after beef is cooked. Slice the flank steak against the grain into 1/4″ thick bite-size slices. Tilt the blade of your knife at about a 45-degree angle to the top of the steak so that you get wider cuts. Dust the pieces on both sides with potato or cornstarch. Let the beef sit, and heat skillet. Add 1 tbsp of vegetable oil and heat to medium, not smoking. Brown the beef in batches. It will release from the pan when the crust forms. Flip and brown the other side. No need to cook all the way through: it will finish cooking in the sauce later. Reserve browned meat on a clean plate as you cook in batches. Add more oil to pan as needed. When all the beef is browned, turn burner heat down only slightly, give a stir to your reserved sauce, and quickly start deglazing the pan with it. It should bubble up and foam immediately like you’re making candy. Stir and lift up all the browned bits in the pan and watch for sauce to thicken slightly. Add beef and stir to coat each piece. There should be quite a bit of sauce, which will continue to thicken from the beef’s cornstarch crust. Add sesame oil and chopped green onion batons at final minute. If you add too early, the onions lose their bright green appearance. Serve over rice. Be warned: this is a rich dish, so go easy on adding the gravy. This is best presented as part of a larger meal: steamed veg, dumplings, other dishes. A few delectable bites is heavenly. Too much and you’ll find it overwhelming. In a renewed effort to rid ourselves of recipe clippings and clutter, we have a new theme for the next few months. We’ve been hoarding mountains of clippings over the years. Such a charity case: there is no PF Chang’s anywhere near us. So memories from Vegas and Palm Desert will have to suffice. Once and for all, we’re going to knock off one of these clones weekly. And oddly, we’re starting with a dish we’ve never tried, and no longer exists on the menu. Dali Chicken. It features a savory garlic chili and cumin sauce. “Our spiciest chicken dish served with sliced potatoes and leeks.” But it’s the menu photo that really grabbed our attention. Those chili pods. The leeks. This is a superb winter dish. Warming and spicy. And we love that it isn’t sugar-laden. It comes together very quickly. Recipe forums have occasionally sported comments from former employees who divulged the “white sauce” component: chicken broth mixed with a bit of oyster sauce. Thanks for the tip! 1 yukon gold potato, thinly sliced Into half moons (photos show thin slices and 1/4 inch thick, so we haven’t decided which is better. Preheat oven to 375. Toss potato slices in oil and roast in a long pyrex baking dish until browned on bottom. Steam rice. Meanwhile, slice chicken and leeks. Mix stock, garlic, ginger, oyster sauce, Sherry, vinegar, soy sauce and chili garlic paste in a bowl and combine. Set aside. Add chicken and stir fry. Add cumin and continue to stir fry until chicken turns opaque. Stir in sauce and let it bubble. Add potatoes and stir to fully coat with sauce. Stir in the scallions or leeks. Sprinkle with black sesame seeds. Many online copycats claim to have cracked the PF Changs’ code, but we’re skeptical. Whisk over a low heat until warm. We aren’t anywhere near P.F. Chang’s China Bistro Triple Happiness happy hour. Sob! So we were excited to find a recipe for Flaming Red Wontons. But after reading instructions to place a “pea-sized mound of meat” on each skin, we questioned how that size would measure up: If 3/4 of a pound of filling makes eight dumplings, surely the mounds will be bigger than a pea. No matter. Can’t think of a better winter snack with a steaming cup of tea. Makes 8 pork dumplings in a spicy garlic and sesame soy sauce finished with scallions and pickled chili peppers. Combine shrimp and pork mixtures. Make sure the mixture is smooth and not lumpy. If you have a food processor, use it for the mix. With a small spoon, place a pea-sized (?@!) mound of meat mixture into the won ton skin. Moisten the top and bottom corners. Fold over and seal. Place on a plate, cover and place in refrigerator until ready to serve. Have a soup pot filled with chicken stock. Bring to a boil, then lower to a slight boil. Heat the entire batch of sauce. Cook won tons in boiling chicken stock for approximately 2 minutes or until won tons float to the surface. Cook until skins are soft. With a strainer, remove won tons into soup bowl. 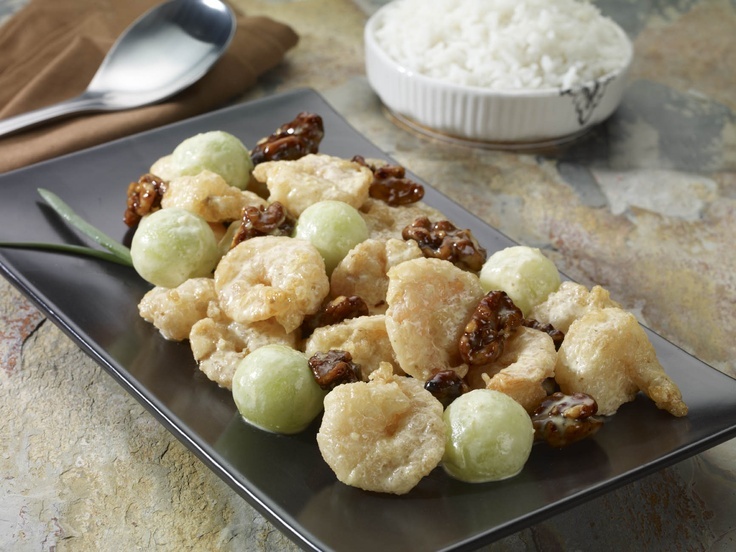 Remember to mix sauce well before you ladle it over the won tons, then ladle 1 ounce of sauce over the won tons. 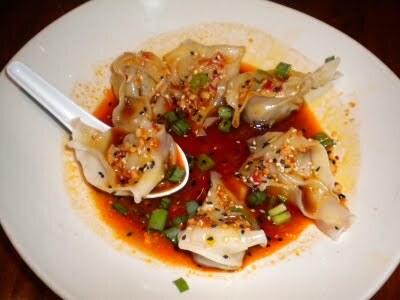 Top each wonton with a small blob of pickled chili sauce or Rooster sauce. Garnish with green onions, cilantro, sesame seeds and serve.